Natural gas prices continue to fall, and spot prices have been below $2 per million BTUs for the last week, trading as low as $1.87 last Friday (see chart above, EIA data here). 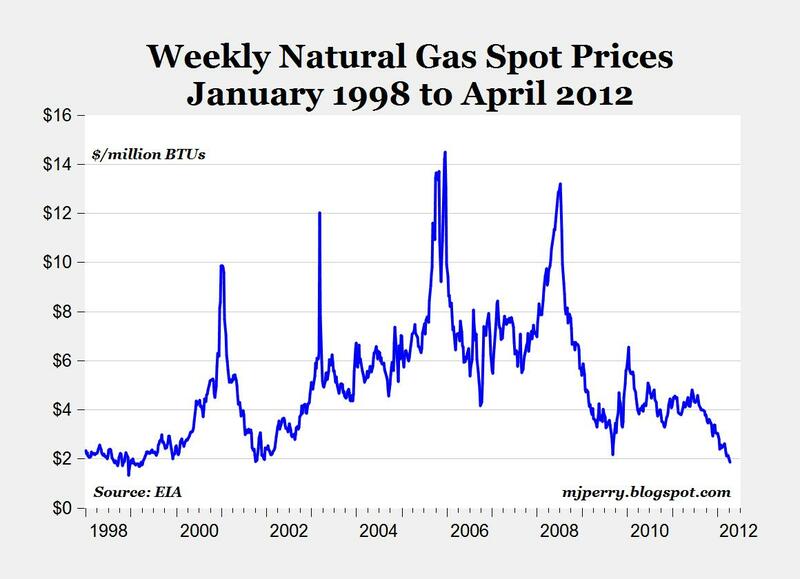 The last time natural gas prices were consistently below $2 was in the spring of 1999, thirteen years ago. Adjusted for inflation, those 1999 prices would be about $2.75 in today's dollars, so the current string of prices below $2 might be the lowest inflation-adjusted natural gas prices in modern U.S. history. Update: EIA spot price data only go back to 1997, but another data source, Global Financial Data, has natural gas prices back to 1930, at least annually for all those years. Natural gas prices were pretty low between 1930 and the mid-1970s, with nominal prices ranging between $0.05 and $0.30 per million BTUs during that period. Adjusted for inflation, those prices were below $1 per million BTUs in some years, so today's prices haven't yet reached those lows. Thanks to Benjamin, who pointed this out in a comment below. I stand corrected. Given average wellhead prices in the 1970s, which were 1/10th or less of the 1990s, it is safe to assume that natural gas prices were much, much lower in the 1970s than in the 1990s. I am not so sure natural gas prices to today are "low." The higher natural gas prices of the 1990 to 2008 period may be an anomaly, caused by expanding global demand and higher oil prices (the latter caused by OPEC and the grip of monkey-thug nations on oil output). Natural gas went up because oil want up. But there is no OPEC of natural gas, and huge finds--the biggest in all history--are being made now, not 40 years ago. Huge strikes are being made everywhere. The private-sector does more for less every year. Long-term we may see even lower natural gas prices. Meanwhile, can we now wipe out the mandated, socialist, pink-o, enfeebling, structural impediment of ethanol? Why is Romney so mute on this score? Hey, keep that information on the down low, Mark Perry. If the speculators hear you, they'll start bidding up NG just to ruin your life. That's what those wily bastards do. @Methinks: So what? Obama will come in with his committee to stop speculation in natural gas and everything will be alright. All for the price of a few million dollars. That's like pocket (Hope and) change. Pre 1960's, there was no real market for natural gas (like today). The 'gas' used for cooking (and lighting at one point) was not the gas we use today. It was producer gas, made from cooking coal. It was more carbon monoxide than methane. This is why people were able to kill themselves by sticking their heads in the oven. They died of CO poisoning. In the 1960's, pipelines were built, allowing natural gas to become available to the public at large by bringing in gas from PA and the Gulf of Mexico. This is a link to photos of what those coking facilities looked like. There were at least three in a 5 mile radius of where I live now. And pigs may fly. Or bankrupt companies will be kept afloat so that they can produce at a loss. No doubt there will be losers. But the price is not set by the losers, it is set by supply and demand. As for pigs flying, you should see some of the people I have had to sit next to in economy class. For 17 hours on the way to Asia. Being a tightwad and skinflint is not always rewarding. You keep ignoring the fact that the producers do not want to waste capital by drilling at these low prices. The problem comes form the lease terms. They have to drill and produce or risk losing those leases. Suppliers cannot respond and must keep producing even when there is a glut. 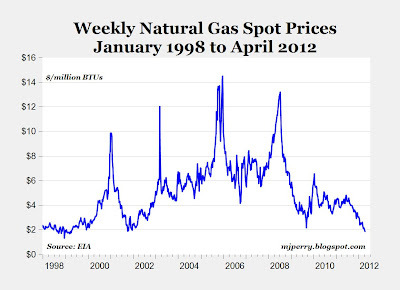 I am amazed at the declining price of natural gas. Every other commodity is up over the last five years with the exception of natural gas. Why the surprise? The shale players have to drill and produce in order to keep their leases. Add high storage volumes and a very warm winter in the northeast and you have perfect conditions for low prices. If we get a cool summer you will see a further decline that should take out many companies once their hedging programs have run their course and no sales are possible at such high prices for a while.